Partnership between the tribes and the Oregon Department of Veterans' Affairs is first of its kind. 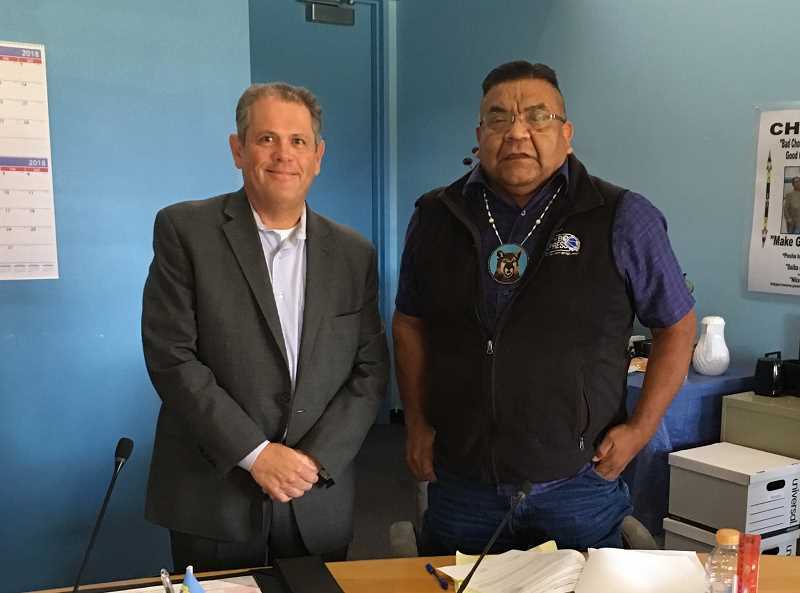 The Oregon Department of Veterans' Affairs and Confederated Tribes of Warm Springs signed a memorandum of understanding last week that will enable the tribal government to establish the state's first-ever tribal veteran service office. Once established, the tribal veteran service office will operate similarly to a county veteran service office, providing direct services to tribal veterans under ODVA's power of attorney. Like all county veteran service officers, the tribal veteran service officers will be trained and certified through ODVA. This is the first state-tribal partnership of its kind in Oregon's history. "This is something we've been working toward for many years," said ODVA acting Director Mitch Sparks. "The reason we have veteran service offices in each county is that we recognize each county has their own unique challenges, resources and culture, and we believe veterans are best served in and through their own communities. The same is true, and even more so, for our tribal veterans." "We believe this new partnership will allow tribal veteran service officers in Warm Springs to provide the same level of service as any county veteran service officer, while advocating for their own people," he said. "This MOU will enable veterans to receive increased access to services and benefits on the reservation by trusted tribal representatives who are more culturally sensitive," she said. The announcement was also well-received by Oregon's elected officials. "As the daughter of a veteran, I know firsthand how critical the needs are for our servicemen and women, and their families," Oregon Gov. Kate Brown said. "I am absolutely thrilled about this new partnership that ensures the veterans of the Warm Springs tribe will be able to access the vital services and benefits they've earned." "The memorandum of understanding represents a major accomplishment for veterans everywhere," said Rep. Paul Evans, chairman of the House Interim Committee on Veterans and Emergency Preparedness. "This approach will be the first of what I hope will be many such partnerships empowering tribal veteran service officers and yielding tremendous benefit to Native American military families and veterans." ODVA will work closely with the Warm Springs Tribal Council to develop and implement the new office. An anticipated opening date has not yet been set.